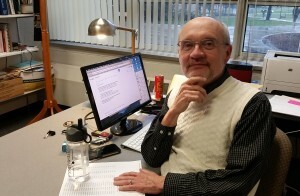 Social media made the problem of hoax news worse today than ever before, according to Garry Gilbert, Oakland University’s director of journalism. Hoax news can be used by people with an agenda to draw readers, spread rumors or exploit resources, according to a Snopes article. “It was more than a hundred years ago that Mark Twain said, ‘A lie can go halfway around the world while the truth is still getting its pants on’,” Gilbert said. The fashion designer Michael Kors hoax — a post of him saying something racist — is an example of hoaxed news used to spread rumors — this kind of thing shows up regularly on social media. It started the hashtag #BoyCottMK, according to a Snopes article. Journalism of assertion is when a news outlet hears a story from a source they trust and pass it on without fact checking it. Whereas, journalism of confirmation is when a story meshes with the reader’s beliefs, and they accept it as truth, according to Gilbert. The nature of how news spreads on social media caused a lost in fact checking gatekeepers. “The news is barely distinguishable from rumors and gossip,” Gilbert said. “Never deliberately distort facts or context, including visual information. Clearly label illustrations and re-enactments,” the Society of Professional Journalists’ code of ethics said. Social media has an issue with people trying to troll. They will slander then spread it as fact, according to Dr. Adina Schneeweis, an Oakland University journalism professor. “We have to be really careful. Someone’s career, someone’s life, someone’s marriage could be in the balance when you use fake or hoax news,” said Brian Bierley, Oakland University’s director of media relations of 22 years. If the information is serious, readers can look to see if anyone else is covering the story, according to Schneeweis. “You as a reader, as you’re scrolling through your Facebook and Twitter, you have to be a little better judge,” Bierley said. With the amount of news put out, it isn’t realistic for readers to fact check every article . However, quickly checking where it came from would help. If it’s from a reputable news source, there is has a higher chance of it being real, according to Schneeweis. Whether a journalist is working for a student newspaper or for the New York Times, it’s necessary to fact check the information. Someone is counting on it being accurate, according to Bierley. Verify sources as thoroughly as you verify the information. Pay attention to the way the information is communicated, if it changes be extra cautious. Contact the people that would be the most ideal to confirm the news. “As a journalism major, you need to keep in mind your credibility is the one asset you own,” Bierley said.